Daventry Town maintained their unbeaten home record with a 2-0 win over Lutterworth Athletic in Tuesday’s United Counties League clash. Goals from Karl Bates and Aaron King, with an early goal of the season contender, earned Daventry three more division one points. That made it back-to-back wins in the space of four days for Daventry. Daventry controlled much of the game and could have gone in front when Bates exchanged passes with King before firing over the bar. Daventry’s dominance continued with Jason Lee volleying straight at Craig Coombs from a corner and the impressive Adam Confue shooting just wide. Lutterworth went close when Dom Ivens’ curling effort came back off the bar. Darren Watts was also called into action when Elliot Herbert slipped on the edge of the area, injuring himself in the process, and Callum Wills pounced but his shot was blocked by the Daventry keeper. Daventry’s pressure eventually paid off in the 26th minute. A well worked move saw Bates put clear after good link-up play between Jordan Orosz and Confue and he beat Coombs. Daventry had strong appeals for a penalty turned down just a minute later when Confue was brought down by Coombs but referee Trevor Martin adjudged the keeper had played the ball. King’s cracker arrived on the half hour mark. Teeing himself up, he unleashed an unstoppable 25 yard volley past Coombs and into the net. Just before halftime Confue linked up with Orosz but his shot was tipped over for a corner by Coombs. The second half was also dominated by Daventry but they were unable to add to their two first half goals. Confue and Sam Heavey both went close shortly after the restart. Heavey also went close on the hour mark when he volleyed Confue’s free-kick over the bar. 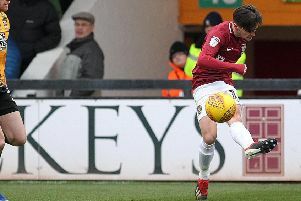 Heavey saw his shot tipped onto the bar by Coombs, Elliot Lamb Johnson was also denied a penalty after he was brought down and he also had an opportunity when one-on-one with Coombs but his attempted chip was easily saved by the keeper.